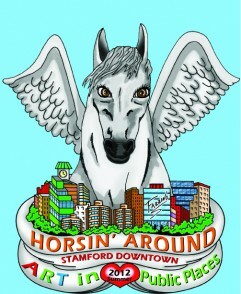 Stamford Downtown, http://www.stamford-downtown.com/, is proud to announce that they have commissioned 3D pop artist Charles Fazzino, https://www.fazzino.com/, to create the logo and visual identity for this Summer’s art exhibit, Horsin’ Around Stamford Downtown, Art in Public Places. Not only will Fazzino create the event logo and serve on the board of jurors, but he will also contribute his own talents to painting one of the larger-than-life-sized horse statues that will be placed all around Stamford, CT beginning in June. Look for the horses to start appearing in and around town in June. The exhibition will continue through August, after which the sculptures will be sold at auction with a portion of the proceeds benefiting The Ferguson Library in Stamford, CT.
Horsin’ Around Stamford Downtown, an exciting interactive outdoor sculpture exhibit, will transform the city of Stamford’s downtown area into a colorful equine environment this summer. In early June, Stamford Downtown will place 40 oversized, originally designed and painted fiberglass horse statues throughout Stamford Downtown and the Stamford Town Center. The artistic horses will be on display for free public viewing and enjoyment by thousands of area residents and visitors all summer. Horsin’ Around Stamford Downtown is the fifth art exhibit of its kind produced by Stamford Downtown, a non-profit organization responsible for managing and promoting the Stamford downtown as the region’s destination for dining, entertainment, retail, housing, and education. Stamford Downtown has assembled some of the tri-state’s most talented artists to create works of art using the unpainted fiberglass horses sculptures. The artists were chosen from a pool of 200 submissions through a juried selection process. Once a design is chosen by a sponsor, it can take up to four weeks to complete. Artists can choose to work on their horse at Stamford Downtown’s Public Art Studio at 61 Broad Street, or at their own art studios. The public is invited to view the artistic process of turning the blank horse canvas into art at the Public Art Studio. After the summer-long exhibit, the horse sculptures will be rounded up and refurbished for an art auction. A portion of the proceeds will benefit The Ferguson Library. Horsin’ Around Stamford Downtown builds on the enormous successes of past interactive exhibits, CowParade Stamford 2000, Art-O-Mobiles in 2001, Stamford Safari in 2003 and It’s Reigning Cats & Dogs in 2010. Those exhibits brought record -breaking tourism and spending dollars estimated in the hundreds of thousands to the downtown CT area and over $400,000 was raised for charities as a result of the four art auctions.